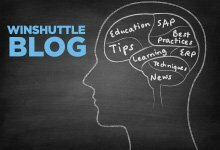 Recently, I wrote about the benefits of focusing transaction analysis on SAP processes such as order to cash, record to report, procure to pay, and material management in a blog post dated February 19th. The discussion centered on using factors like transaction volume, process complexity, time savings and other metrics as a way to determine SAP business processes to improve. 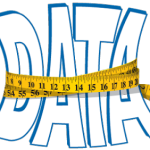 Now let’s take a further look at these analytics by drilling deeper into the SAP transaction data – and get to the actual user level of analysis. After conducting thousands of user interviews, value assessments, analyzing SAP transaction logs and Winshuttle usage logs – one of the key findings is that usually there are select areas of SAP users – individuals and groups, that are “deeply” engaged in the business processes. Generally this is a minority – 20-30% of the overall SAP user base – whom would realize the significant benefit of process innovation. Also, interesting to note here the correlation to the “Pareto Principle” (also known as the 80-20 rule, the law of the vital few, and the principle of factor sparsity) which states that, for many events, roughly 80% of the effects come from 20% of the causes (Wikipedia, n.d.). The value assessment process identifies all ERP users and their transaction activity – in addition to providing background on their manager, department, division and other important details. Here’s an example illustrating the data and corresponding analytics of the SAP user information. In the following table 1 we see the aggregate number of material creation (MM01) transactions executed in a period of time (a month in this case) was 2,865 transaction executions. Notice that there is an overall complexity ratio of 47 (# of steps / # of times). In theory, the higher the complexity ratio (CR) the more complex the transaction – in fact a rule of thumb here is that a CR greater than 10 is cause for concern. So this ratio assists us in identifying those transactions where users are “churning” or spending time in excess processing screens etc. The median seconds represents the total savings per MM01 transaction – in this case 150 seconds – achieved when optimizing this transaction with Winshuttle. Finally the FTE factor is simply taking the # of times the transaction is executed – multiplying this by the median seconds to get the total time savings in seconds. The total seconds figure is then divided by 60 (to get minutes), 60 again (to get hours), and 8 (to get work days saved). This is then the FTE (full time employee work day – 8 hour day) savings factor which helps to assess where the best opportunities in terms of capacity enablement exist. Now looking at the table 2 –we see that it highlights 14 users who have executed material creation (MM01) transactions in this given period. At the user level we now start to see some interesting patterns developing. First of all (green highlighted box) we see that users MD10009, KM46100 and KJ46002, are high volume creators of material data. This is a clear indicator for time savings (Est. Days Saved per Year) opportunities – as we can see a potential of 60, 37 and 29 days savings per year respectively for each of those users. 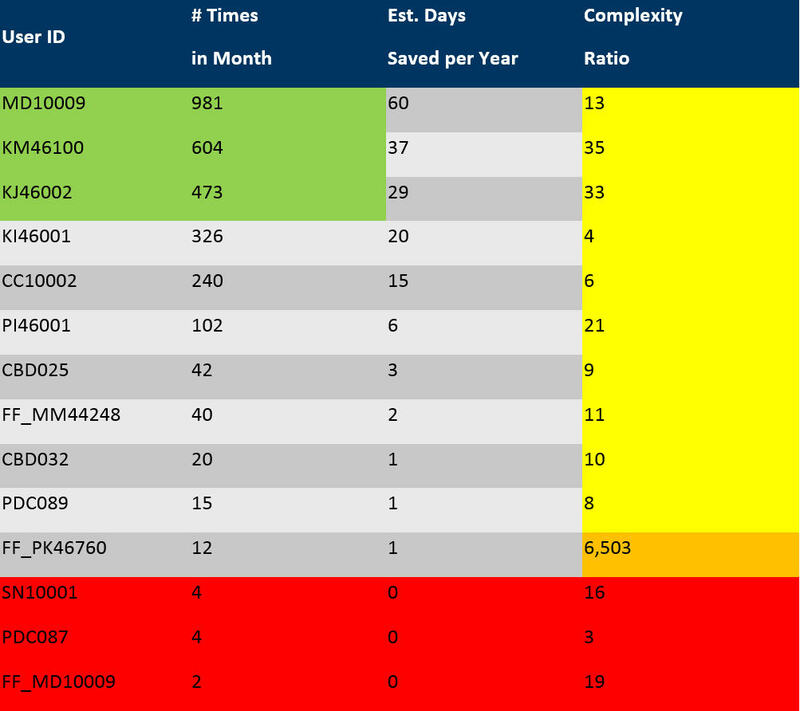 Looking now at the Complexity Ratio (CR) column we notice a wide range of disparity in the complexity ratio for all of these users – so this is an indicator that there could be opportunities to adjust processes either by leveraging tools to streamline and / or additional training for these users. Again as a general rule of thumb, a complexity ratio greater than 10 is worthy of investigating why there is so much “churn” taking place in a particular user’s use of a particular transaction. We also notice that there is an outlier worthy of investigating (User FF_PK46760). This complexity ratio is a huge outlier at 6,503 and worthy of understanding why this is occurring. Finally, the bottom 3 users in the table (users SN10001, PDC087, and FF_MD10009) should be reviewed as to understanding if the little work they are conducting with MM01 could be conducted with other users and their workload distributed elsewhere. Conversely – it may also be worthwhile to ask the question, are there contributors to this material record who don’t access SAP? This would possibly be someone who “originates” a material creation request. Or an “approver” somewhere along the material creation workflow process. So in this simple example (usually there are 100’s of MM01 users plus dozens of processes made up of 100’s of transactions) you can see how just a small set of data can identify significant areas of process improvement. Typically, in a larger value assessment process we identify a dozen or so processes where Winshuttle can accelerate your company’s time to value. Many companies have taken advantage of the value assessment process and have realized critical areas in their company’s operations where SAP process innovation delivered significant benefit. For example, Disney Studio was able to id a process ML81N that was a significantly time consuming and manual process. Maersk ID’d a range of finance transactions that were using Excel macros to process with a manual update taking place at the conclusion of the process – these processes and users were id’d through the value assessment process. Another example, recently was with a large consumer goods organization who literally had no visibility into a significant population of their SAP users – with this process and user centric assessment process – they quickly ID’d a range of process innovations and moved immediately to realize the capacity enabled. If you are interested in learning more about Winshuttle’s value assessment program, just send a quick request for more information to bvaprogram@winshuttle.com.